The University of Ulster has celebrated the success of its flexible access programmes for young people and adults at an award ceremony in the Jordanstown campus. More than 200 students were presented with certificates at the ‘Celebration of Community Achievement’ evening, which recognised each person’s commitment, determination and creativity within their module or project. In conjunction with community partners, Ulster has developed a wide-ranging portfolio of flexible learning opportunities for adults, young people and those in the workplace. Learning programmes such as Active Citizenship, Internet and Multimedia, Integration and Good Relations through Sport, Community Development and Social Networking were among the achievements noted at the awards ceremony. The University supported these programmes as part of its Widening Access and Participation Strategy. “This project has an extremely positive impact on the local communities in Northern Ireland. I congratulate all those who received an award this evening – their achievements will not only reap personal benefits, but make a significant and outstanding contribution to the communities in which they live. 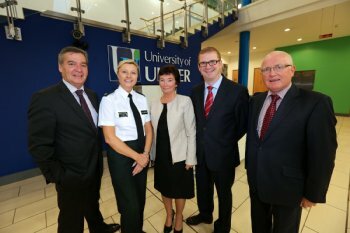 Students were welcomed into the higher education community and encouraged to continue their lifelong learning journey by Ulster’s Vice-Chancellor Professor Richard Barnett. He said: “One of the University’s corporate goals is to provide excellent, student-centred, flexible programmes of study which are accessible to all those who have the ability to benefit from them. Special guests at the celebration included representatives from community, schools and voluntary organisations such as the Sport Changes Life Foundation and the PSNI, which supports education in local communities.